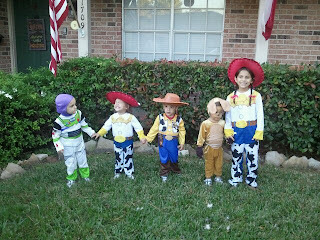 And here they are this year 2010~ They LOVE Toy Story so we have Cooper as Buzz, Cole as Woody, Ella as Jessie, Kennedy as Jessie & Casen as the Slinky Dog. 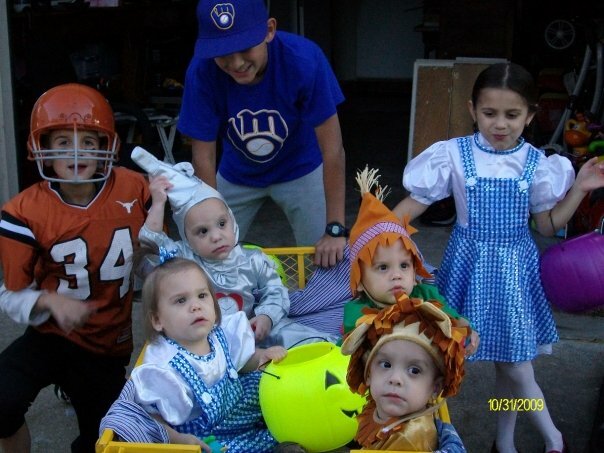 Haiden really wasn't to into dressing up this year, so I never could manage to get a picture with him in it. They absolutely loved trick or treating this year and TOTALLY rocked saying "trick or treat" when they would go up to someone's door! P is for PUMPKIN or POSE! The quads had pumpkin day at school yesterday! I quickly snapped some cute pictures of them POSING with their pumpkins! They were SOOOOOOOOOOOO excited to take them to school. Ah yes, my favorite time of the year EVER~ FALL! So, with that being said, I had really wanted to go to Dewberry Farms last year, but the WEATHER was so not on our side. So I decided that this year WE WERE GOING NO MATTER WHAT~ and that is just what we did. The eight of us, Nonnie, Auntie Heather, Cousin Gavin, AUntie Ashley & Aunt Debbie piled into 2 cars and off we went for the hour drive~ It was really worth the wait & ride. Although we weren't able to get to do EVERYTHING in the 5hrs we were there, we did indeed have a great time. Oh and since I mentioned the 5hr stay at the farm, let me also throw in that the babies had NOT had a nap that day and were AWESOME~ We got to ride a hayride out the pumpkin patch to pick out our own pumpkins and the kids really loved that. This is the big kids & Casen on the hayride with their prize pumpkins! I took this sweet picture of Miss Kennedy & Miss Ella~I have to say this picture just melts my heart EVERYTIME I look at it~I hope they always stay close, because I know how much my sisters mean to me & what a great relationship we have. And then we have daddy here, who was such a GREAT SPORT, why you might ask? Well, you see he gave up watching his DALLAS COWBOYS to be with the family at the farm. However, in this picture you will notice his "earplugs", those "earplugs" just so happened to give him play by play of the game~HA! Cole aka: CoCo with his Auntie Heather being such a ham! Cooper with the pig, I swear this child IS NOT afraid of ANYTHING~can I also just add that ever since seeing the pig at the farm, his now favorite noise to make is......a snorting pig! Kennedy giving the goats a lesson on no biting! HA! Then last but not least we tried to get a family picture at the farm, however, note to self: NEVER EVER save family pictures for the last event of a FIVE HOUR day on the FARM~ Cooper was trying so hard to get away from his daddy HA! We did indeed have a great time together "on the farm"! Oh, and I would also like to mention we did not take a stroller, wagon or anything for the babies. It does make me a little sad that they are growing up sooooo fast!!!!!! Yep, you read it right! We have to DUCT TAPE the diapers on to the quads! WHY, you might ask? Well, because as much as I would have no problem with of any of my kids growing up to be artists, I DO HAVE A HUGE problem with them being POO-CASSO! YEP, they play in their poop~seriously how gross is that? Well, let me just tell you it is as gross as you imgained it being TIMES FOUR~ So since we had tried everything, we had to resort to duct taping their diapers. EXCEPT for Casen, we had to duct tape the top of his pants. You know there is always one in the group that has to be the CREATIVE one. However, after about 4 months of duct taping their diapers, I am pleased to announce we no longer have to use it on the diapers. It has been placed back in daddy's work bench. I can't believe that the kids are already back in school. My, where did our summer go? Haiden started 6th grade this year, he was a little apprehensive because he would have 4 teachers and not be on a team anymore. They are trying to get them ready for Junior High, did I REALLY just type JUNIOR HIGH????? He is however adjusting just fine to the new schedule & homework. He did AWESOME last year on his state mandated tests and even got Commended on Reading (he only missed one question) so he got a medal. This is a HUGE accomplishment for him seeing that he is Dyslexic in Reading. He was so proud of himself, as were we. He will be playing baseball, showing his heifer & pig at the county fair again this year. He is also wanting to run for student council! Kennedy started second grade this year! She has Mrs. Gomez and LOVES her. She was also Haiden's 3rd grade teacher. She LOVES LOVES LOVES school, or is the dressing up and matching accessories that she likes?HA! She is such an AWESOME reader and loves to read too! I hope she continues to have this passion for reading. She will be taking dance again this year. However, she is patiently (NOT) waiting for next year, because she too will finally be able to show at the county fair. The quads also started school this year, or should I say Mother's Day Out. It is Tuesdays & Thursdays. This was their first week, and there were NO tears shed by ANYONE, not even me! Their teacher said they were really good & great helpers at picking up toys. She also said they LOVE to wash their hands in the classroom sink! HA! As a matter of fact when Jeremy and I went to pick them up, there they were washing their hands. Hmmm....maybe they remember their early days of being preemies and everyone always washing their hands! Just kidding, well about them remembering being preemies. They also all kept talking about the "big potty". We haven't started potty training yet, but the school offers to help out when you do start potty training, so I am thinking around Thanksgiving we will give it a whirl! They were so funny when they came home from school, they were smiling and singing and LOVING on EVERYONE! It was soooo sweet to watch, it just reminds us that this was a good decision putting them in school. Ella kept going around saying, "I liiiiiiiiiike school". Lets just hope they continue to love it as much as they do right now.